Let's hope this holds true. ^^ That image of 360 initially made me wonder if it was a rendering of a building that didn't happen. Weird angle. I am not sure if anyone has already posted this; however, the ground leases for 105 W Riverside (two-story office building), 500 S Congress(Congress Square Apartments) and 510 S Congress (The Egos Office Building) all come due I think late next year. We have offices in 105 W Riverside and were told to find somewhere else to move to. The same guy owns all three parcels, and I would be shocked if it is not redeveloped the same time as the Statesmen Site. Also, TXDoT's leases 105/118 E Riverside (which abut the Statesman site) expire around 2022 (I think). Lastly, the guy who owns the old La Bear building has come out and said he is on the site until the Statesman/TXDot sites get re-devolved. If we can manage to stay out of a recession until the mid 2020's, that part of downtown is going to be super dense. I know someone who lives in the South Congress Sq. apartments. He is already looking at other places to live, since he is sure that those apartments don't have more than a year or two left in them. The Business Journal also had an article on this. 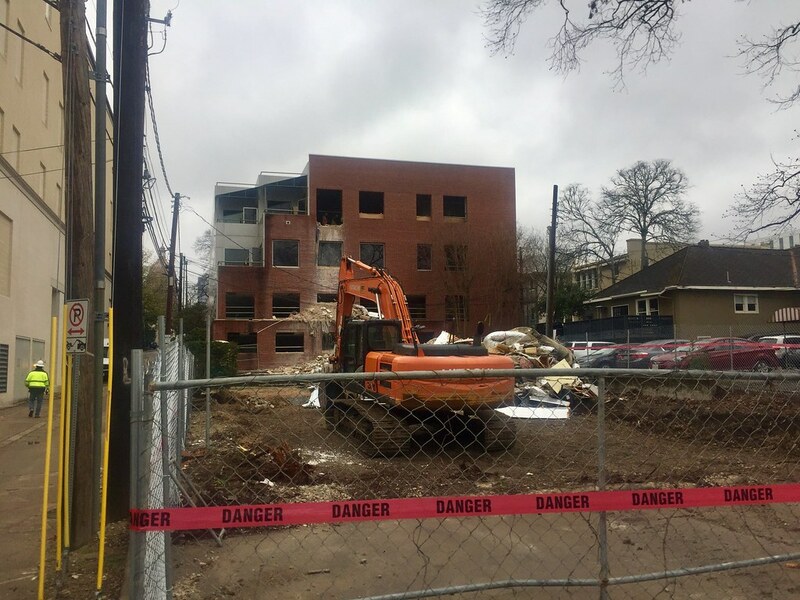 As the pressure on Austin’s affordable housing needs increases, a new plan that waives zoning and design standards could carve a path for dense, subsidized housing on lots in high-opportunity single-family neighborhoods throughout the city. The program, introduced this week by District 4 Council Member Greg Casar, has gained initial support on City Council. It does not target traditional housing developers. Instead, it involves organizations and nonprofits such as Habitat for Humanity that aim to produce deeply affordable and subsidized housing for low-income residents, but often run into restrictions baked into the city’s land development code. The program as proposed would waive parking requirements, compatibility standards for height and setbacks. It would also allow at least six units on a lot—if feasible—for projects of three units or greater where at least half of the units are reserved for renters at, or below, 60 percent of the median-family income or homeowners at, or below, 80 percent of the median-family income. For projects under three units, 100 percent of the units would have to be affordable to qualify for the program. Existing impervious cover limits would remain in place. Casar said the program could produce as many as six affordable units on current single-family lots. Larger multifamily developments could see “dozens more” income-restricted units, he said. The program aims help carry Austin to its goal of building 60,000 affordable housing units by 2027. Towers.net did a mock up of our future towers in Google Earth. Demo work is ongoing. New 3-story building at 1205 Nueces; while the larger building in the background is a renovation to the existing structure. Fencing is up for that mixed use office on Lamar/oltorf. Have we seen renderings on this yet? Also, on that pic that shows WC in the distance.....WOW! That density in WC is amazing from that angle. 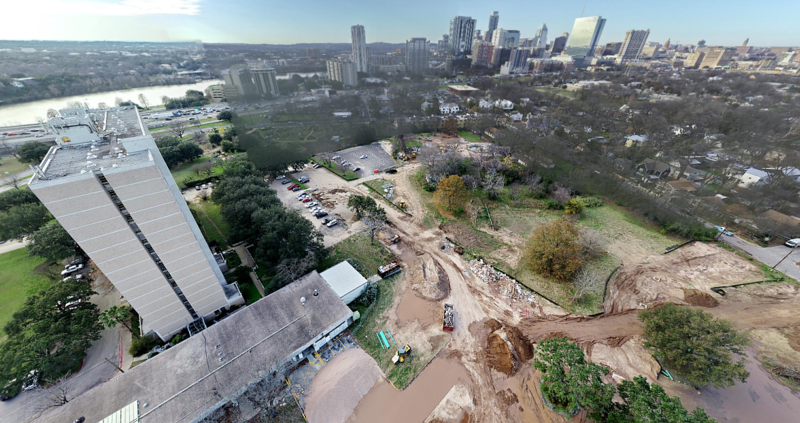 The 4.5-acre development, designed by Austin architect Michael Hsu, will have 165,000 square feet of office space, 2,500 square feet of retail space, a rooftop deck and two acres of green space bordering Bouldin Creek. Look at that quaint little two lane road with one car on it. Ain't that nice? Here'a a new hotel - Hotel Neches on 8th St. It's not exactly new - it was proposed as a Home2Suites a couple years ago. The site is the surface lot between Hotel Indigo and the Homeless Army. It's five stories of hotel above three levels of underground parking. Real estate magnate Nate Paul, CEO of World Class Capital Group LLC, has a new business plan for many of the buildings he’s snapped up across Austin over the past few years. Paul just launched NowSpace, which he claims will be the largest provider of flexible office space in the city. He boasts of controlling 1.2 million square feet in 12 buildings in every Austin submarket. That would make him a major player in a hot segment of the real estate sector — flexible space refers to office space with short-term leases that can easily be enlarged or shrunk, and it is in high demand across the capital city. And Austin is just the start. Paul has plans to roll out the service in other cities across the country this year; he didn't disclose where they might go next but Houston and Dallas have been batted around in social media posts. To date, WeWork Cos. has been the predominant provider of class A coworking space in Austin. The company now has 448,000 square feet in five locations. A sixth location with about 48,000 square feet is set to open this spring in the renovated Westview building near the Texas State Capitol. Paul plans to hire more than 100 people at his NowSpace headquarters in Austin. He said the aim is to fill "a huge void in the Austin market" by offering creative offices, not space inside high-rises. NowSpace properties range from downtown Austin's historic Phillips Building to the Offices at Braker near The Domain in North Austin. Beyond that, Paul declined to identify other potential locations. However, a look at the buildings he owns offers some intriguing possibilities. World Class Capital owns a notable number of high-profile downtown Austin sites, such as the IHOP restaurant at the corner of Cesar Chavez Street and I-35 and the old rowing center across the street from the Austin Convention Center. Yet many of the buildings adorned with the “Another World Class Project” banner are empty, such as the site of the former Headhunters bar at 720 Red River St., the Phillips Building at 103-105 E. Fifth St. — where Karma Lounge and Kingdom nightclubs used to be — as well as 422 Congress Ave., the old home of Ethics nightclub. World Class’ portfolio also includes the J&S Koppel Building at 318 Congress Ave., a warehouse at 99 Trinity St. and industrial buildings at 501 Waller St. and 1216 E. Sixth St.
One thing those properties have in common is they aren’t traditional office space. NowSpace will design, build and operate flexible office space for companies ranging from one employee to 10,000, according to its website, with coworking, private offices and even custom headquarters space. Just how big is Nate Paul's latest real estate move? The 1.2 million square feet he wants to put on the market is the equivalent of more than two Frost Bank Towers, Austin's largest office building at more than 535,000 square feet. Paul said the first NowSpace properties will be ready for tenants by April 1. “Several of our NowSpace workspaces are custom-built for large enterprise customers and are in the process of being built out for these customers currently,” Paul said. He said NowSpace is in discussions with “many large companies” for headquarter space. Other flexible office and coworking companies are growing rapidly in Austin. WeWork continues to lease tons of space and recently purchased 4.7 acres at Red River and East Cesar Chavez streets where it could build its first ever ground-up development. New York-based Industrious LLC will open a second Austin location — 23,658 square feet — at 823 Congress Ave. in the third quarter of 2019. Seattle-based coworking company Riveter Inc., which caters to women, announced in January plans to next month open in a 12,000-square-foot space just west of downtown. Work Well Win, a coworking startup founded by former WeWork executive Frank Bistrian, will open a 100,000-square-foot location at Eightfold in East Austin this summer. Real estate experts expect Austin's appetite for flexible office space — which includes coworking space as well as incubators and other short-term options — to keep climbing. Central Texas is a haven for the kinds of entrepreneurs with those needs. Flexible space accounts for about 2.8 percent of Austin’s total office inventory of 54.1 million, according to real estate firm JLL. Flexible space accounts for less than 5 percent of the U.S. office market but is expected to jump to 30 percent by 2030. While flexible space is in high demand, JLL Executive Vice President Will Douglas said Austin’s inventory will grow at a slightly slower pace than the national rate. Douglas said all of the larger national and regional companies his firm has worked with recently are moving in and leasing coworking space. Speaking in general terms, Douglas said there would be a lot of interest if someone like Paul injects a million square feet of space into the flexible office market in or near the Central Business District. Demand is higher for newer, class A flexible office space than older buildings, Douglas said. Ugh. Nate Paul is the worst. All that property just languishing. I bet this idea prototypes with one space, and then never goes anywhere. He has no follow-through on large-scale development. Right of way closures for Block 36 construction start as soon as next week. One question I have is whether these spaces have been built-out as coworking spaces or whether tenant improvements are done after leases or memberships are signed. Buildouts take time, which would challenge the ready “now” assumptions. With the Phillips Building, I ran several permit searches and can find no new plans for the interiors via web portals at the city of Austin or changes from nightclub or venue usage. A friend of mine jokingly referred to this as Fyre Coworking with Nate as Billy McFarland and Jamaal Charles as Ja Rule. It appears the biz journal gets all their stories from Austin Towers and ATX Real Estate. ...and quite a few things get mentioned on here first. I love days like these when I log on and see a ton of threads have been updates. Austin is HOT!